Brighton Ford : Check Out The Many Faces Of Garrett, The Brighton Ford Pet Of The Week! 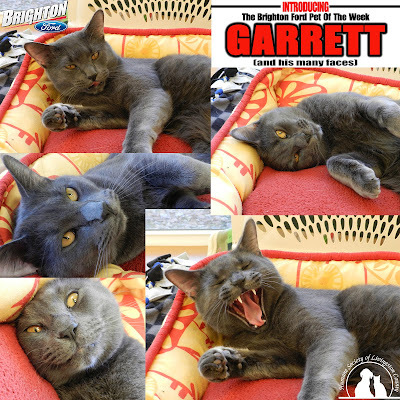 Check Out The Many Faces Of Garrett, The Brighton Ford Pet Of The Week! Garrett is a very SWEET and easygoing 3-year-old neutered male with a rad looking gray color! Humane Society of Livingston County doesn’t know too much about me because I was a shelter transfer. They have spent time with me and have learned that I’m a nice, adventurous and lovely boy who deserves the best. I enjoy your company, being pet and being brushed as well. If you look close enough, you can see that I have some peek-a-boo tiger stripes in my coat, how cool is that? I’ve been around other cats and seem to do well as long as they don’t annoy me!! I love to watch out the windows and lay in the sun. I can’t wait for my furrever home.